Your cat has just gone into full attack mode, and now you’re terrified of the little guy who, until a few minutes ago, was your best friend. An aggressive cat can be scary and even dangerous and can really test your relationship. But there are ways to live peacefully and happily with an aggressive cat. I know this from personal experience. I’ve done it! My aggressive cat was also my soul mate. Loving him was like being in a bad marriage! There’s always a reason why your sweet, loving kitty suddenly turns into the Cat from Hell. But you might have to call on your inner detective to figure out what it is. Here are some clues to get you started. But first, a few words of caution. Never try to pick up or touch a cat who’s being aggressive. He could hurt you badly! Don’t yell at him, either or turn the spray bottle on him. Making a loud noise or spraying him with water could just upset him more and cause him to attack. If you have treats or noisy toys close at hand, gently toss some across his field of vision to try to distract him so you can get out of harm’s way. Or stand perfectly still, blink at him and talk softly to him until he loses interest and finds something else to do. If you can be calm, nonthreatening and patient, he’ll calm down and go on his way. So here are some reasons why cats become aggressive. 1. Illness or pain: Pain can cause a cat to lash out and become aggressive. 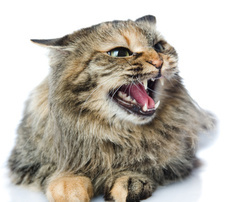 Hyperthyroidism, too, can cause aggression in cats. If your usually sweet cat suddenly becomes aggressive, he should see a vet right away. 2. Fear: Some frightened cats just freeze, but others lash out and even attack when they think they’re trapped. If you have a nervous cat, make sure he can always see an escape route and never feels like he’s backed into a corner. This is especially important when you have company. Ask your guests to not approach the cat. If children will be visiting or if your guests will be moving around the house, it will be safer for everyone and happier for the cat if you put him in a comfy room with food and a litter box. Or, if he’s an indoor/outdoor cat, encourage him to stay outside until all the visitors have gone home. 3. Too much touch: Some cats love being petted, some have limited patience for it, and others truly hate it. If your cat has limited patience, he’ll let you know by nipping your hand or even grabbing your hand with his claws and teeth. Learn to read your cat’s body language so you’ll know when he’s had enough. When he twitches or flips his tail, turns his head towards your hand or seems restless, it’s time to stop. Encourage him to get off your lap by tossing some treats or a toy on the floor. Most cats are consistent about the number of pets they can tolerate. If your cat becomes impatient after five pets, stop at four. If your cat does bite you while you’re petting him, say “No!” firmly. Don’t yell at him, just be firm. Or hiss at him. Mother cats hiss at their kittens when they misbehave. Your cat will understand if you speak his native language. Hold perfectly still, too Being still mimics an experienced female, and when there’s no response the cat will get bored and disengage. 4. Invaders in his territory: All cats are territorial, but some are more territorial and less welcoming of strangers than others. For these hyper-territorial cats, an animal passing through the yard or a visitor bringing unfamiliar scents into the house can trigger aggression. In homes where there is more than one cat, a cat coming home from a visit to the vet or groomer can also trigger aggression because he no longer smells familiar. If outside cats are upsetting your indoor cats by passing through your yard, be relentless in discouraging their visits. Some indoor cats see outside cats as a threat, and in an effort to protect their territory, will lash out at anyone who’s within reach, including other cats and humans. Redirected aggression can cause some very ugly cat fights! You can discourage outside cats from visiting by making a loud noise when they appear, or using an electronic deterrent, like a CatStop or ScareCrow. When you have overnight guests, ask them to spray their luggage and other belongings with Feliway or rub them down with a washcloth or towel that smells familiar to the cats. Mingling scents will make your guests’ possessions smell familiar and keep a hyper-territorial cat from becoming aggressive. It’s also a good idea to mingle scents when a child comes home from college or when you’ve been visiting in a home where there are other cats. If you have more than one cat, it’s best to schedule checkups with the vet for all of them at the same time. If that’s not possible rub down the cat who’s been to the vet with a washcloth that smells like home before bringing him into the house. That will make him smell familiar so he won’t alarm the other cats and trigger a fight. If you decide that you and your aggressive cat really cannot live together, please don’t take him to a shelter. Shelters generally do not put aggressive cats up for adoption, and he probably won’t come out alive. Instead, think about making him a completely outside cat or find a barn home for him. Cats can live very happily in barns where they’re welcome and have humans who will care for them and feed them every day. If you rehome your aggressive cat to a barn, both he and the people around him will be safe.